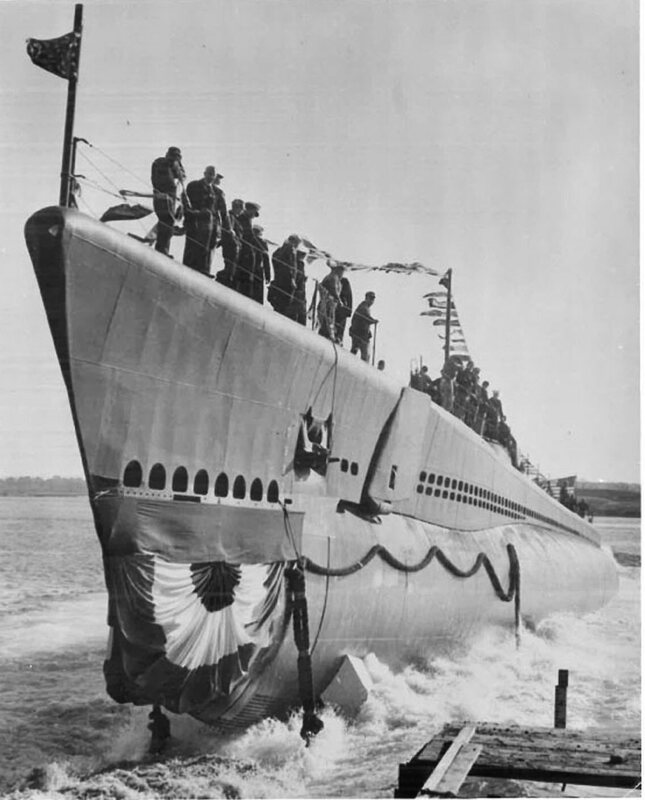 Balao Class Submarine: Laid down, 26 June 1942, at Portsmouth Navy Yard, Kittery, ME; Launched, 27 October 1942; Commissioned USS Balao (SS-285), 4 February 1943; Decommissioned, 20 August 1946, at the Naval Submarine Base, New London, CT.; Laid up in the Atlantic Reserve Fleet, New London Group; Recommissioned, 4 March 1952; Redesignated Auxiliary Research Submarine (AGSS-285), in 1960; Decommissioned, 11 July 1963; Struck from the Naval Register, 1 August 1963; Final Disposition; Sunk as a target, 30deg. 46.5' N x 74deg. 11' W. 4 September 1963 off Charleston, SC. ; Conning Tower and shears removed prior to sinking as a target for display at the Navy Memorial Museum, Washington, DC.Balao received nine battle stars for her World War II service. 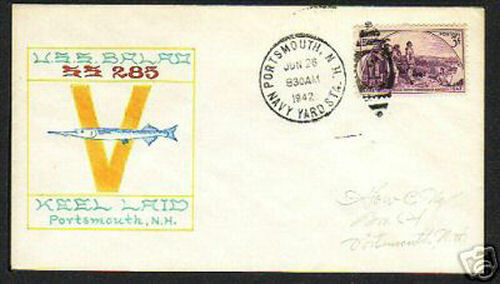 29k Commemorative postal cover marking the keel laying of the Balao (SS-285), 26 June 1942, at Portsmouth Navy Yard, Kittery, ME. Courtesy of Jack Treutle (of blessed memory). 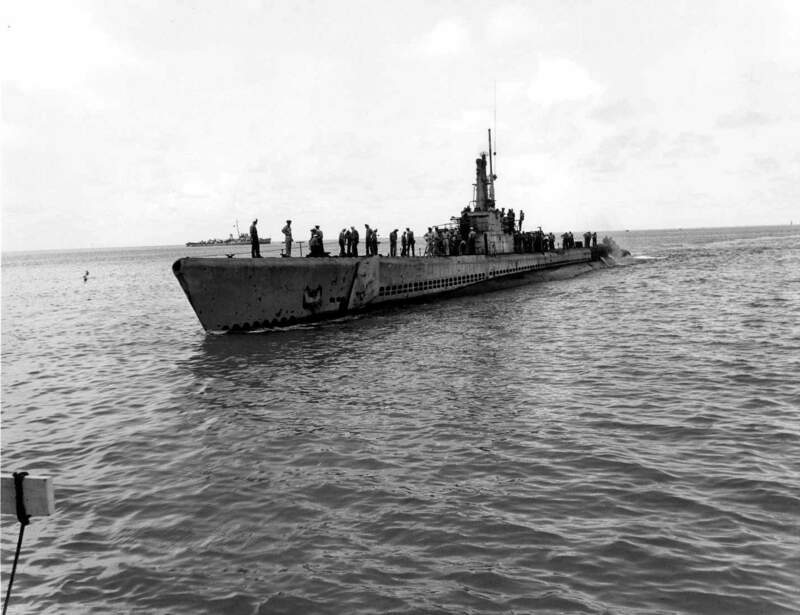 739k The Balao (SS-285) slides to the waters at 2:50 PM on 27 October 1942. USN photo # 80-G-21292, from National Archives and Records Administration (NARA), College Park, Maryland, courtesy of Sean Hert. 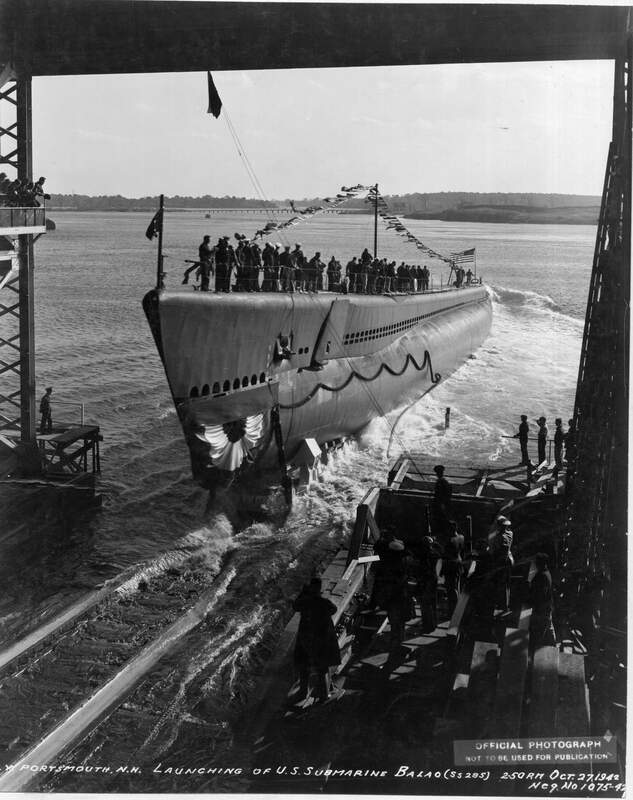 175k Off to the war, the Balao (SS-285) down the launching ways at 2:50 PM at Portsmouth Navy Yard, Kittery, ME., 27 October 1942. Her war operations span a period from 25 July 1943 until 27 August 1945. During this period she completed ten war patrols. She is credited with having sunk seven Japanese ships totalling 32,108 tons, in addition to sinking by gunfire 1100 tons of miscellaneous enemy small craft. Text courtesy of DANFS. 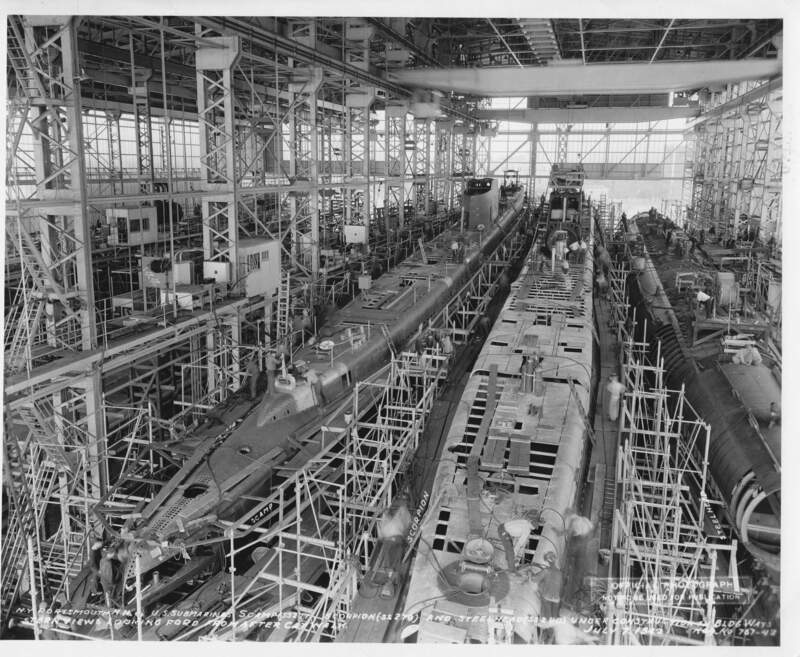 Inset photo courtesy of ussubvetsofwwii.org. Photo courtesy of William J. Webb via his father, Jewell W. Webb, who was a plankowner. 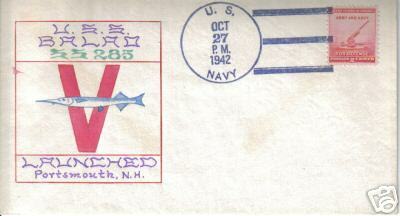 16k Commemorative postal cover marking the launching of the Balao (SS-285), 27 October 1942 at Portsmouth Navy Yard, Kittery, ME. Courtesy of Jack Treutle (of blessed memory). 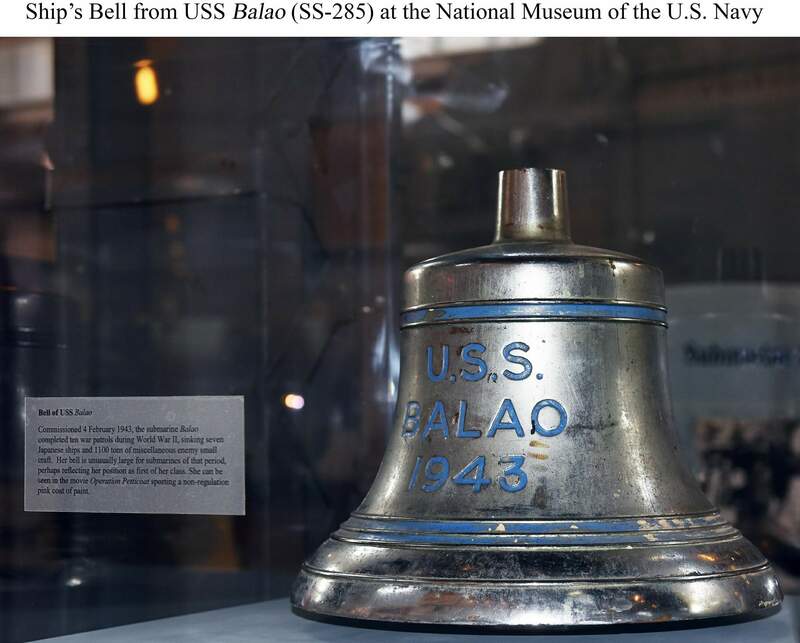 276k Bell of Balao (SS-285). USN photo courtesy of National Museum of the U.S. Navy via flickr.com. 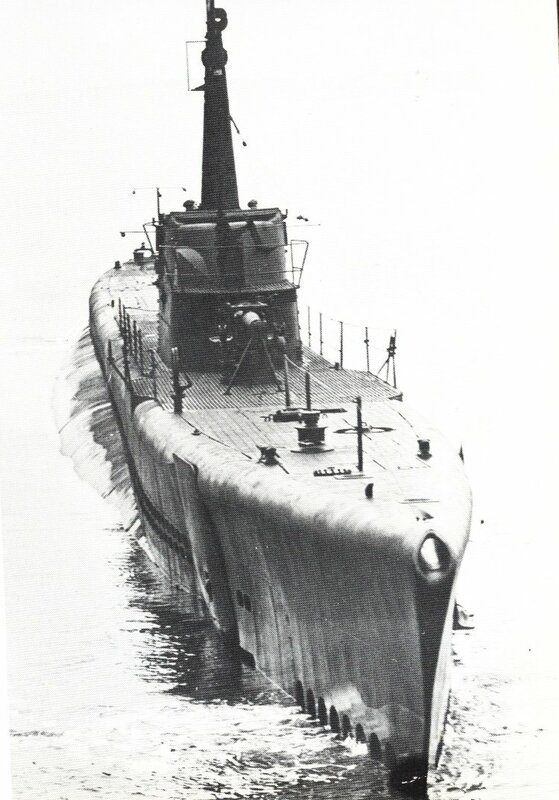 123k The recently commissioned Balao (SS-285) heads out to sea for trials in May 1943. The boat is painted in overall black paint, which was the standard measure of camouflage used at this time. The boat is equipped with a 4"/50 cal gun forward and a 20mm gun on the bridge deck. Due to lack of teak wood for the deck and faster building times, this boat, like others had only the main walking areas covered in wood. The rest of the main deck was covered with thin perforated metal deck. 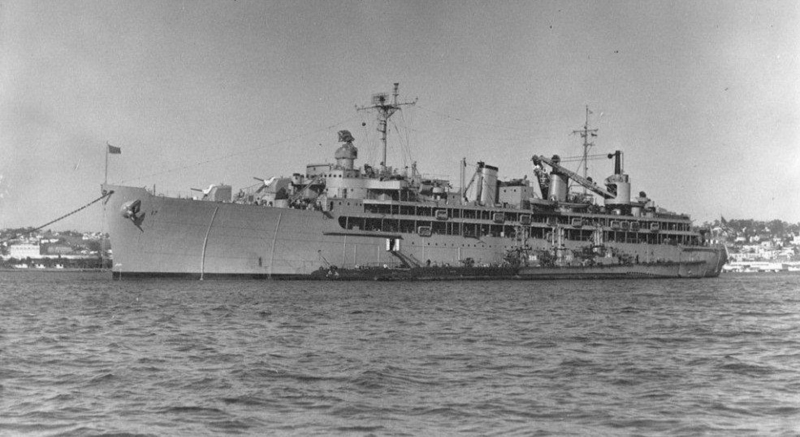 USN photo # 19-N-46319. Photo and text courtesy of The Floating Drydock, "Fleet Subs of WW II" by Thomas F. Walkowiak. 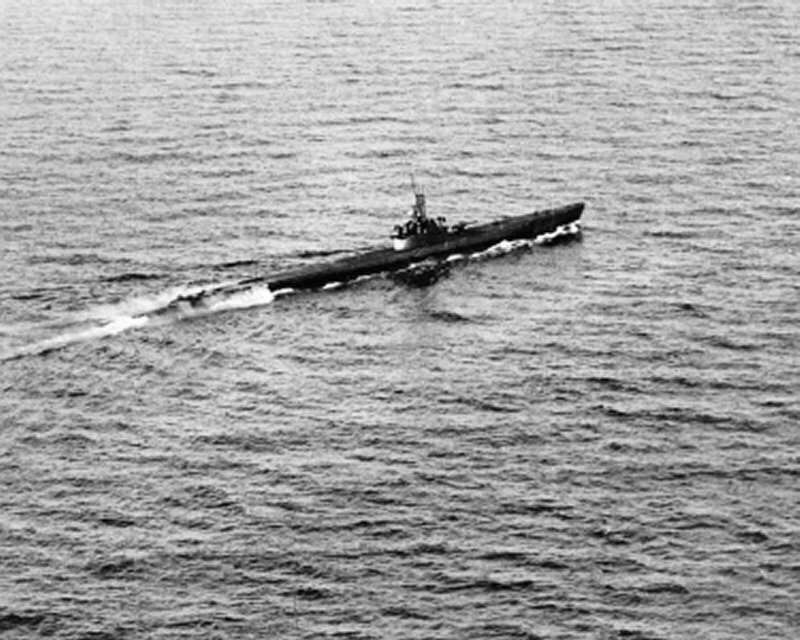 117k Aerial view of the Balao (SS-285) off the New England coast, 31 May 1943. USN photo. 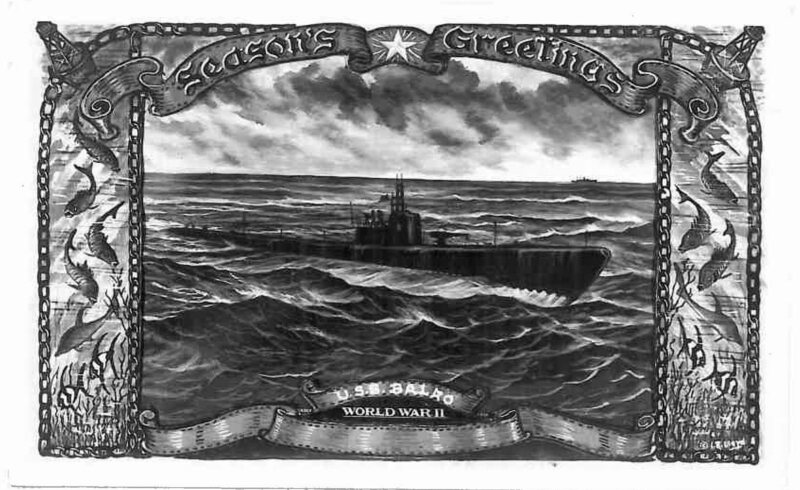 411k Season Greetings card from the Balao (SS-285), from December 43-January 44. Photo courtesy of William J. Webb via his father, Jewell W. Webb, who was a plankowner. 245k The Balao (SS-285) October 1944 at Mare Island, looking aft, shows the addition of a new number one scope and hinges mounted on the stanchions around the guns. They were used to lower the lifeline for a lower angle of fire of the deck guns. USN photo # 6459-44 courtesy of Darryl L. Baker. Text courtesy of The Floating Drydock, "Fleet Subs of WW II", by Thomas F. Walkowiak. 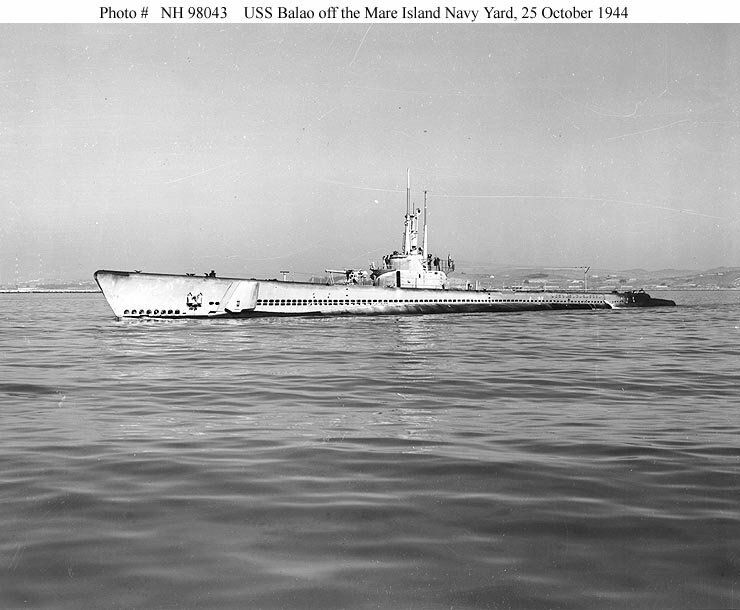 320k The Balao (SS-285) is seen here at Mare Island during an October 1944 refit. Newly added "SD" tower mast and new lookout platforms are circled along with new TBT's. She still mounts a 4"/50 cal. gun forward. The barge YF-557 is beyond her bow. USN photo # 6458-44 courtesy of Darryl L. Baker. Text courtesy of The Floating Drydock, "Fleet Subs of WW II", by Thomas F. Walkowiak. 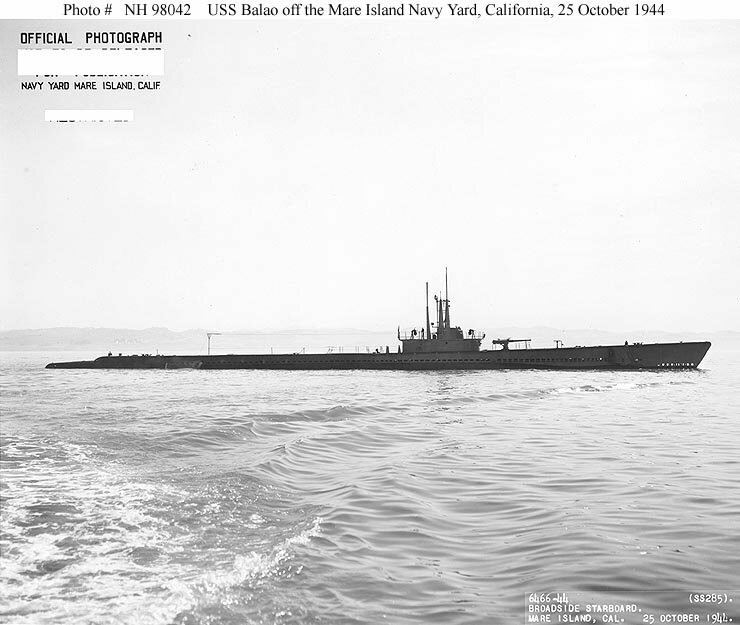 76k Balao (SS-285) off the Mare Island Navy Yard, Vallejo, CA., following overhaul, 25 October 1944. USN photo # NH 98043, from the collections of the US Naval Historical Center. 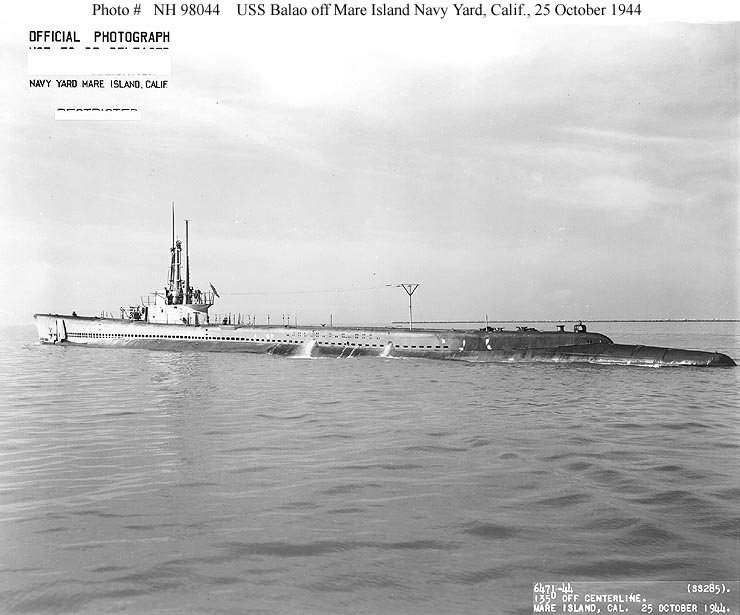 70k Balao (SS-285) off the Mare Island Navy Yard, Vallejo, CA., following overhaul, 25 October 1944. USN photo # NH 98044, from the collections of the US Naval Historical Center. 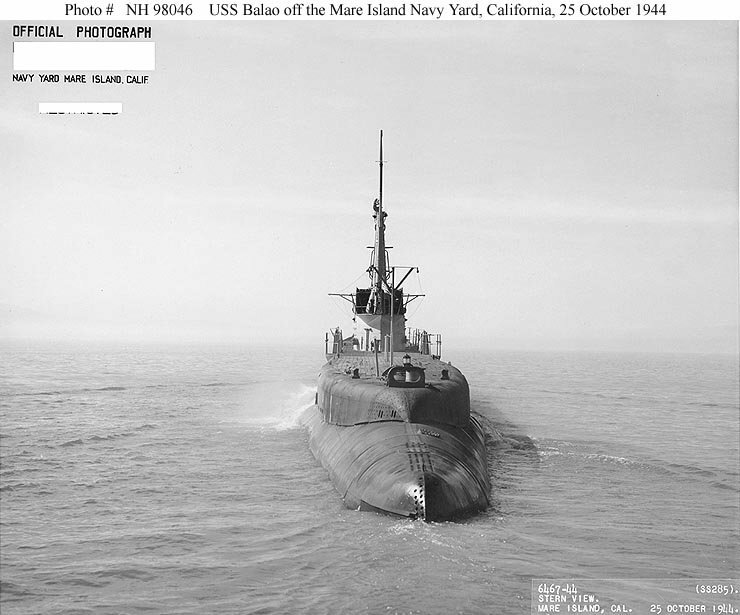 69k Balao (SS-285) off the Mare Island Navy Yard, Vallejo, CA., following overhaul, 25 October 1944. USN photo # NH 98045, from the collections of the US Naval Historical Center. 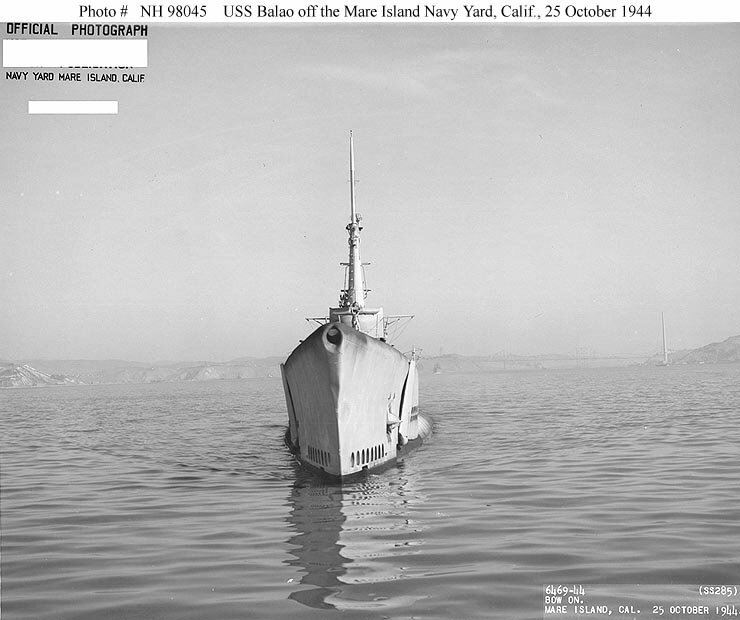 71k Balao (SS-285) off the Mare Island Navy Yard, Vallejo, CA., following overhaul, 25 October 1944. USN photo # NH 98046, from the collections of the US Naval Historical Center. 43k Captain Marion Frederic Ramirez de Arellano, (1913�1980) USN, the first Hispanic submarine commanding officer, participated in five war patrols. He led the effort to rescue five Navy pilots and one enlisted gunner off Wake Island, and contributed to the sinking of two Japanese freighters and damaging a third. For his actions, he was awarded a Silver Star Medal and a Legion of Merit Medal. 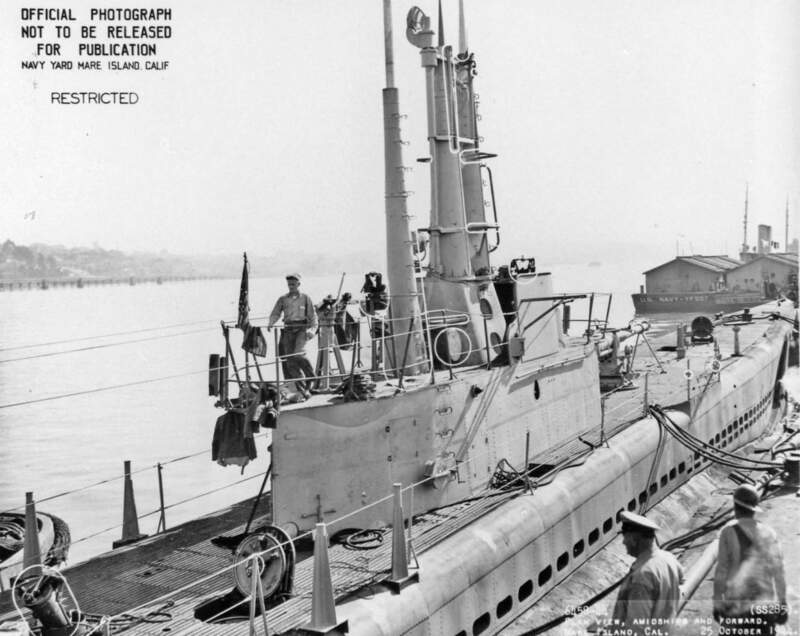 After a brief stint at the Mare Island Naval Shipyard, he was reassigned to the Skate (SS-305), a Balao class submarine. He participated in the Skate's first three war patrols and was awarded a second Silver Star Medal for his contribution in sinking the Japanese light cruiser Agano on his third patrol. The Agano had survived a previous torpedo attack by submarine Scamp (SS-277). 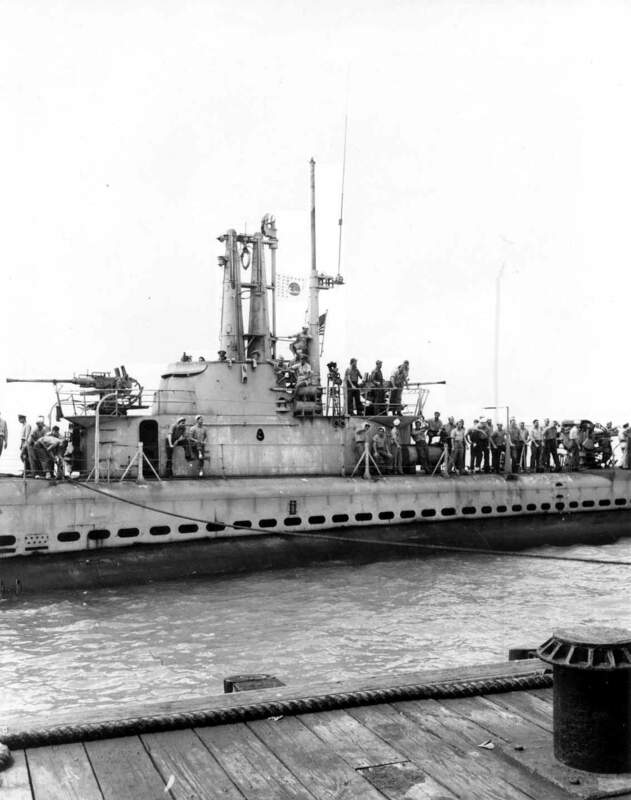 In April 1944, Ramirez de Arellano was named Commanding Officer of the Balao (SS-285). He participated in his ship's war patrols 5, 6 and 7. 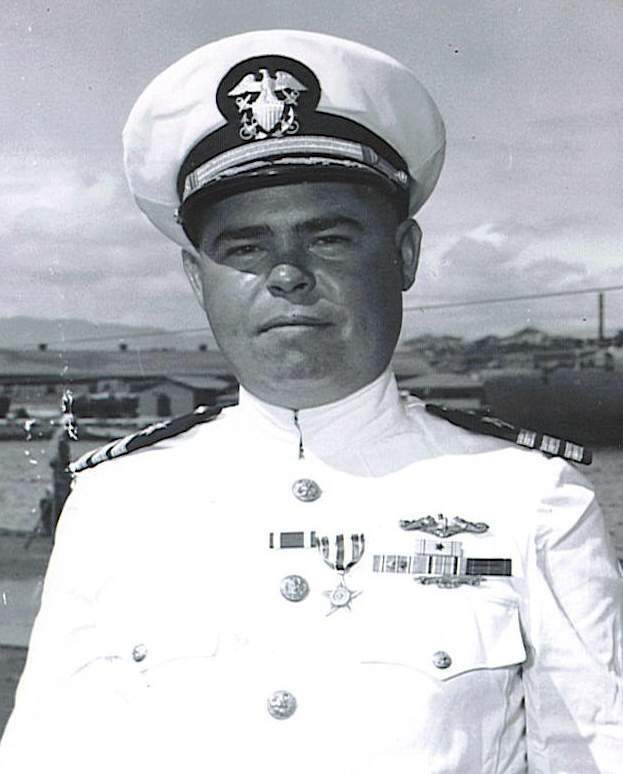 On 5 July 1944, Ramirez de Arellano led the rescue of three downed Navy pilots in the Palau area. On 4 December 1944, the Balao departed from Pearl Harbor to patrol in the Yellow Sea. The Balao engaged and sunk the Japanese cargo ship Daigo Maru on 8 January 1945. Ramirez de Arellano was awarded a Bronze Star Medal with Combat V and a Letter of Commendation. Photo and text from Wikipedia, courtesy of Bill Gonyo. 493k 19 March 1945: 225 miles NNE of Shanghai. At 0258, at 33-07N, 122-05E, LtCdr Robert K. Worthington's Balao (SS-285) attacks the convoy MOTA-43 and torpedoes the Tatsuhara Maru in hold No.2 and the Hakozaki Maru in Nos. 2 and 4 holds. Another torpedo just misses Kaibokan No. 40. The Hakozaki Maru is torn apart by internal explosions as her cargo of gasoline, shells and torpedoes ignites and blows off her stern. She quickly sinks, but her forward section stays afloat blazing until finally sinking at 0320. 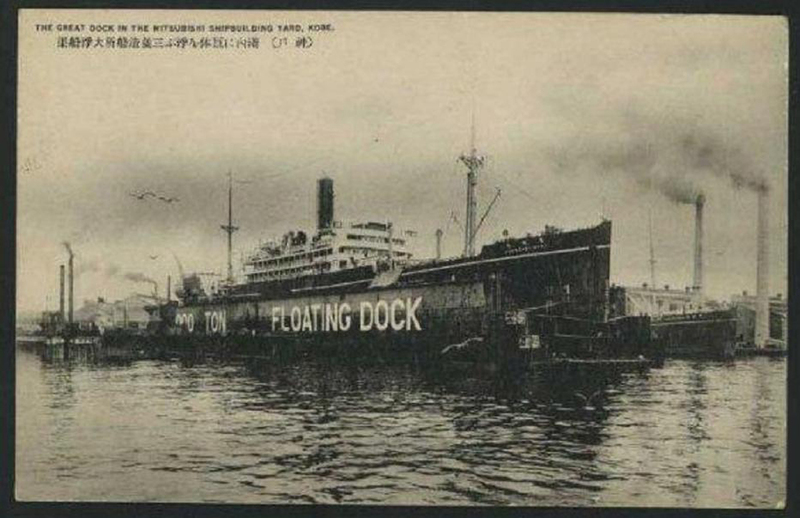 The combination of fire, explosions and 5 degree centigrade water means that almost all aboard perish: 928 passengers, 51 gunners, and 139 of the crew are killed, a total of 1118 lost. The Hakozaki Maru appears in this Kobe Old Postcard Gt. Dock Mitsubishi Shipbuilding Yard. Text courtesy of combinedfleet.com via Tommy Trampp. 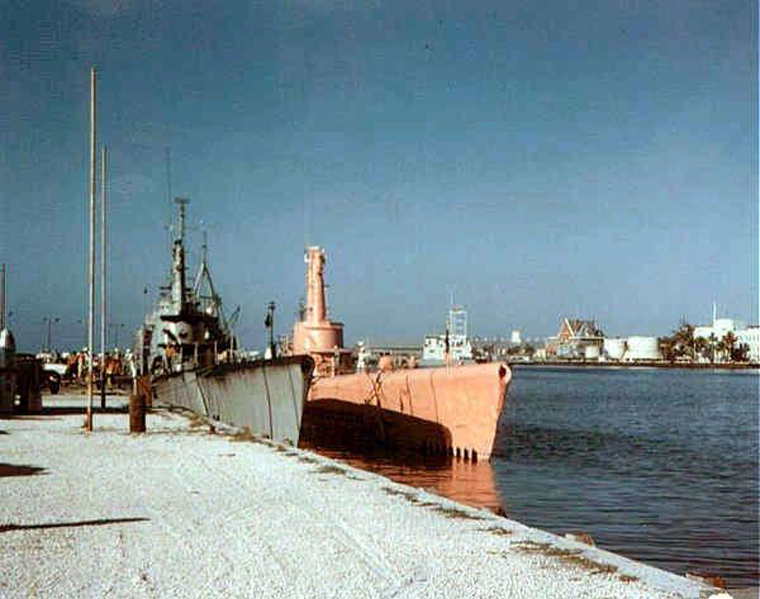 166k With a destroyer in the background, the Balao (SS-285) pulls up to the wharf, circa early 1945. The location is probably Guam. USN photo courtesy of ussubvetsofwwii.org. 99k Balao (SS-285) returns to a Pacific base following a successful war patrol, circa early 1945. The location is probably Guam. Note LCT-1000 in the right distance. 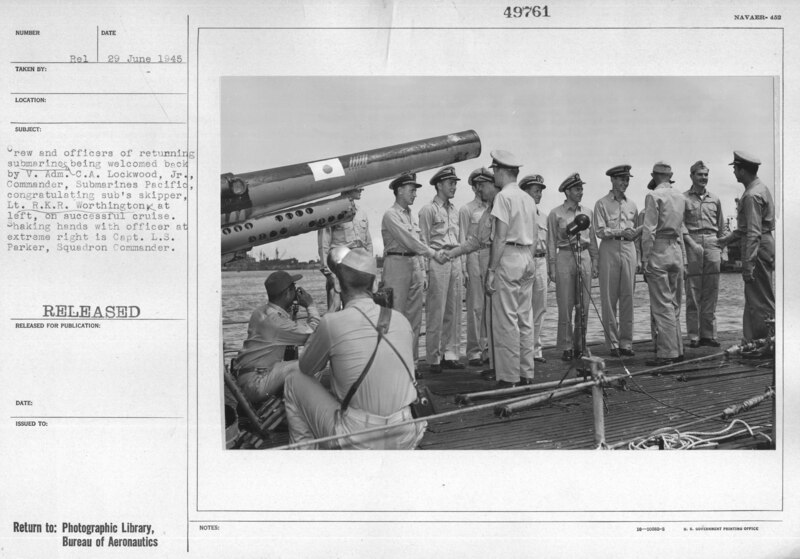 US National Archives photo # 80-G-325538, from the collections of the US Naval Historical Center. 117k Balao (SS-285) returns to a Pacific base following a successful war patrol, circa early 1945. The location is probably Guam. Photo courtesy of Ric Hedman. 39k Deck of the Balao (SS-285) circa early 1945. The officer behind Admiral Lockwood is Balao CO Robert K.R. Worthington. The bushy-eyebrowed officer second from right is Lew Parks, former CO of the Pompano (SS-181) and Slade Cutter's former CO. The officer facing the camera has the first name of Joe but last name is unknown. Photo courtesy of Ric Hedman. 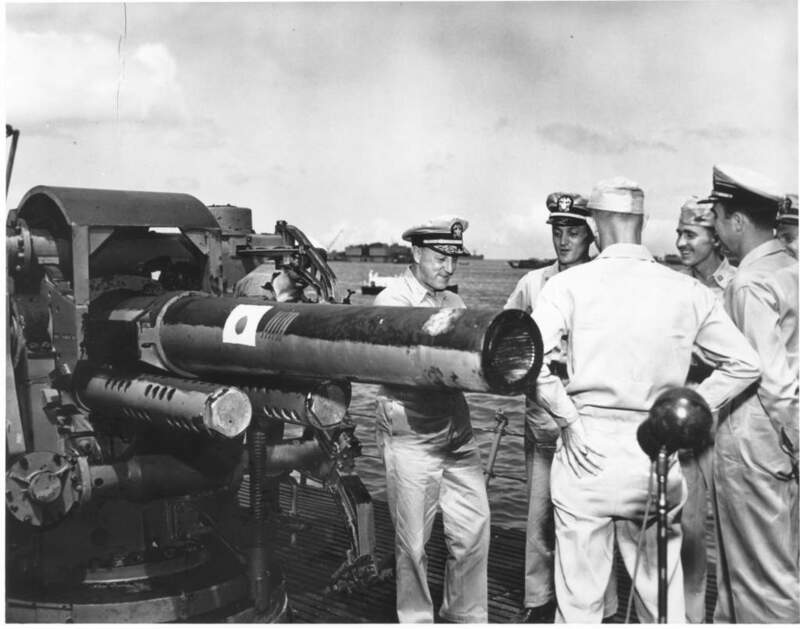 75k ADM Charles Lockwood, Commander, Submarine Forces, Pacific Fleet, on board Balao (SS-285) to welcome the sub back to port from a war patrol, circa early 1945. Location is probably Guam. The officer to the right of Admiral Lockwood is Balao CO Robert K.R. Worthington. 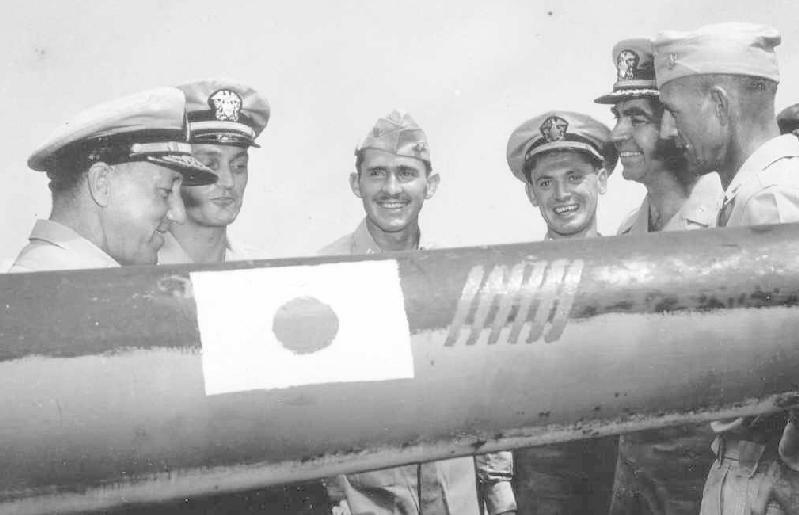 The bushy-eyebrowed officer to Worthington's right is Lew Parks, former CO of the Pompano (SS-181) and Slade Cutter's former CO. USN photo courtesy of Naval Sea Systems Command & submitted by Bill Gonyo. Photo i.d. courtesy of Ric Hedman. 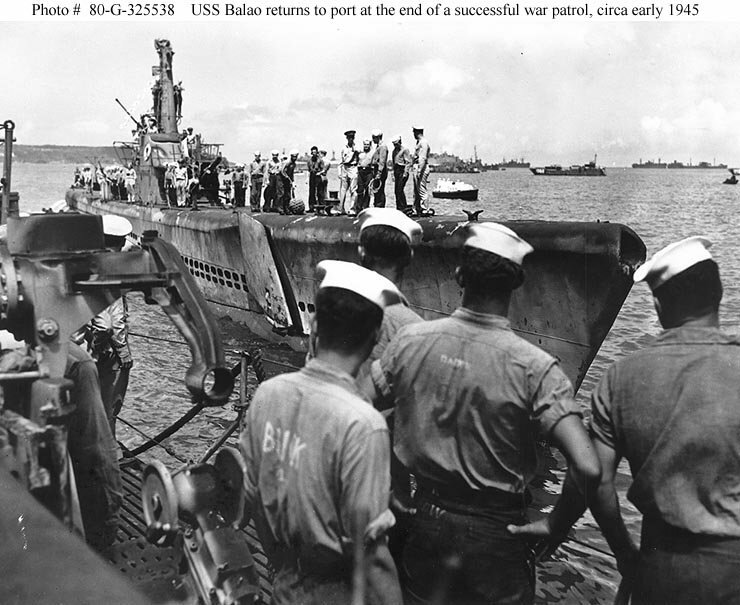 122k Balao (SS-285) returns to port after a successful war patrol, circa early 1945. 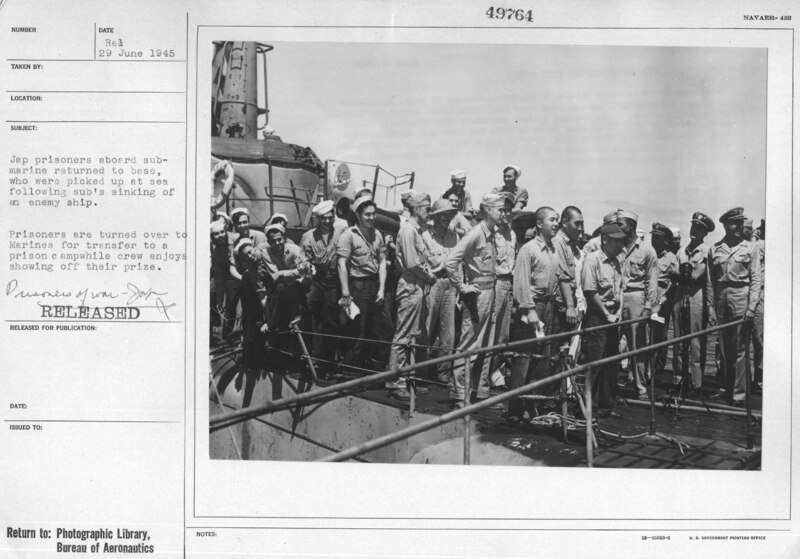 Japanese prisoners are being escorted along her deck. Location is probably Guam. USN photo courtesy of Naval Sea Systems Command & submitted by Bill Gonyo. 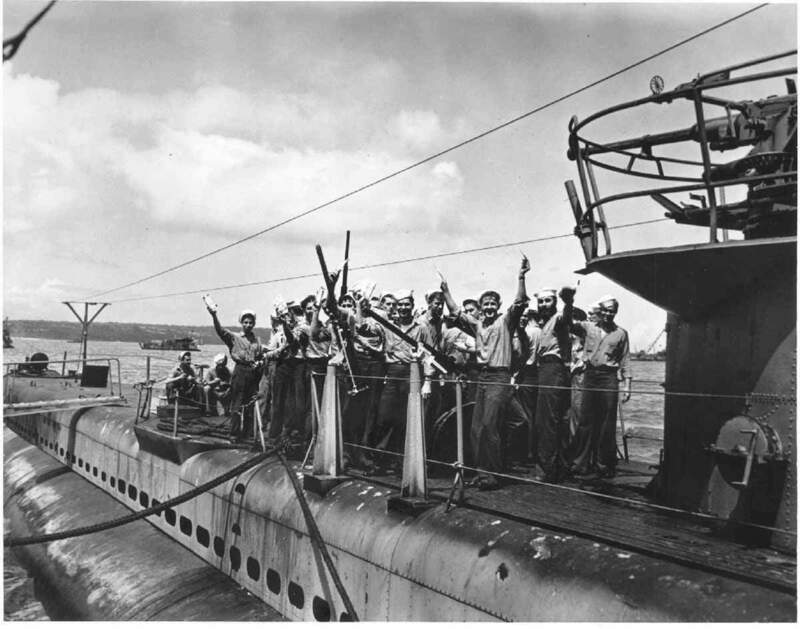 631k Japanese prisoners aboard submarine returned to base, who were picked up at sea following submarine�s sinking of an enemy ship. Japanese, blindfolded while being brought topside, will be taken away to prison camp. Released 29 June 1945. This photo has been censored. The tops of the aft periscope, the SD radar mast & SJ radar masts have been edited out. Photo & text i.d. courtesy of Dave Johnston, USNR. USN photo # 80-G-49763 from the National Museum of the U.S. Navy via flickr.com. 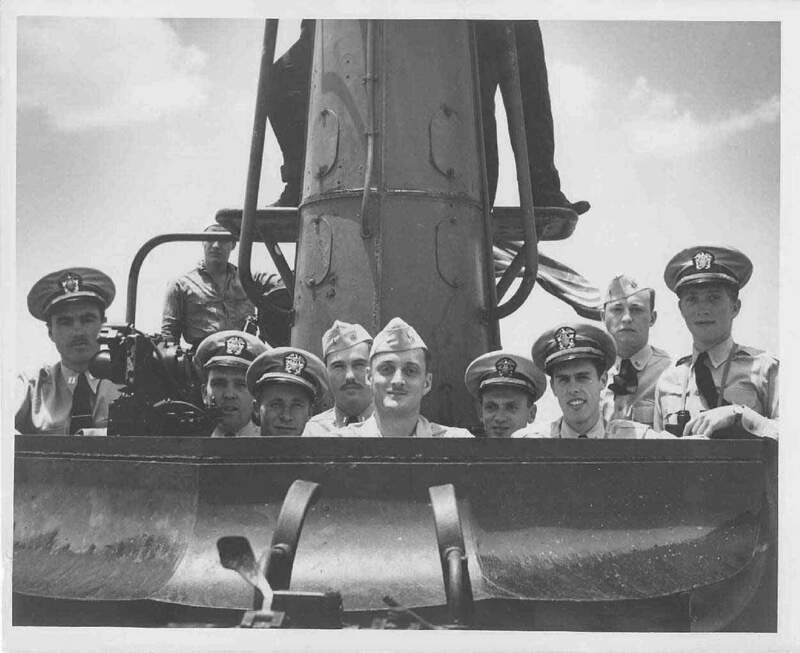 98k Balao (SS-285) Wardroom in WWII, LCDR Bob Worthington, in center, was Commanding Officer. USN photo courtesy of Naval Sea Systems Command & submitted by Bill Gonyo. Photo is from personal Files of CAPT Worthington, NWC Library. 108k Submarine crewmen wave their newly-received mail as their boat returns to port from a successful war patrol, circa early 1945. Submarine is probably Balao (SS-285); location is probably Guam. USN photo courtesy of Naval Sea Systems Command & submitted by Bill Gonyo. 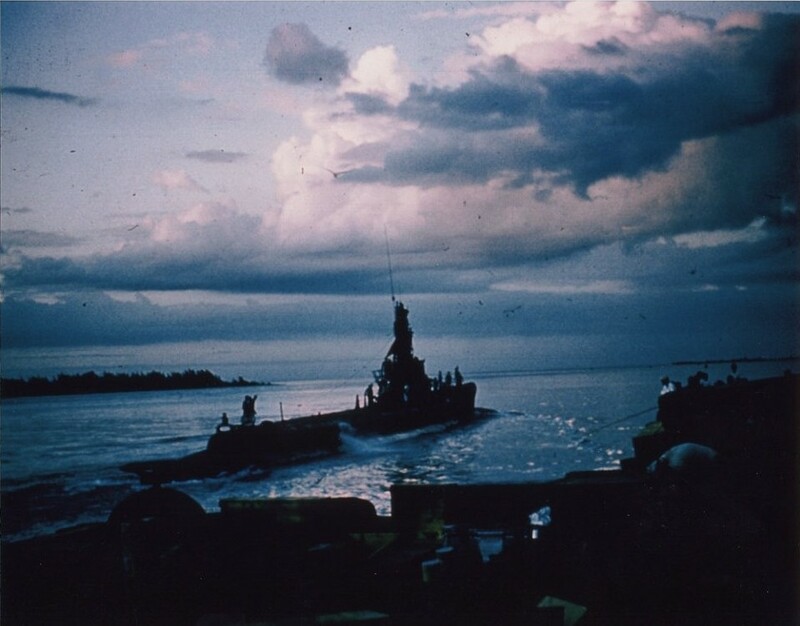 147k The Balao (SS-285) pulls up to the wharf, circa early 1945. The location is probably Guam. This was taken at a later time than the other photos above. With the exception of the 40 mm on the fwd cigarette deck, the photos match in most details. All of the pictures are of the Balao. As the war drew to a close, the boats were "upgunned", with heavier armament being added as large targets became scarce and the boats were engaging smaller luggers and sampans. Along with these armament changes, ammo lockers were added as well and this would account for the additional locker seen in this photo. After the war, most of these additions were deleted as unnecessary. The noted discrepancy in the SD radar installation is not a discrepancy at all. The SD antennae in the earlier photos has a tarp over it, giving the impression of a different antennae. 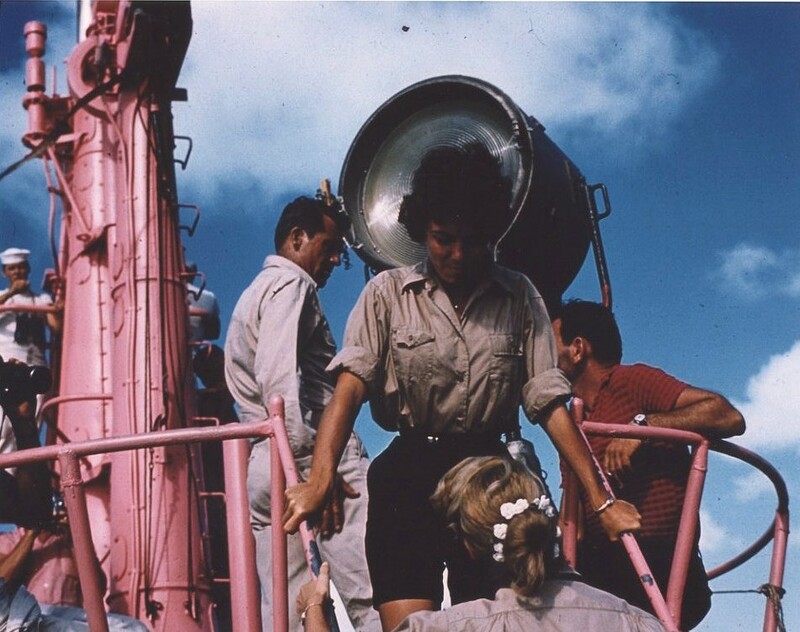 As for the dates and locations on the photos, all could have been taken in "early" 1945 at Guam, but this photo was taken later than the others, probably at the end of one of her last patrols. It is important to remember that the configuration of these boats was hardly static. Indeed, the appearance of the boats often changed from one patrol to the next as new weapons, sensors, comms gear, etc. was introduced. Many of these mods were easily done at the forward bases by the tender crews. The first thing to remember is that every time a boat came into port the crew had new ideas on how to configure her armament. 20mm probably didn't meet the needs of a crew needing to engage sampans and sea trucks where as a 40mm would give good covering fire while approaching a target. The fwd 20mm was no doubt exchanged for the 40mm during a between patrol upkeep. Probably only needing a few days to accomplish. In the photo in question about the battle flag, (Many flags were made and presented to leaving crew members), has 23 "kill flags" on it. In the close up down the page that flag only has 17 "kill flags". The Japaneses ring buoy should give you the photo date as it was pick up as a souvenir of a sinking. Each time the flag was made it may have changed a bit. Many times these were made ashore by folks who were doing this for a living so the crew could work or go play. Every time you came in most of the paint on the hull had probably been blasted off by depth charges and repainting happened with what was at hand, especially in fwd locations. The antenna question must be remembered that these too were "portable" and could be rigged and un-rigged at will. You will notice that there are pics with no antenna rigged. The aft antenna would be in the way of deck action fire if left rigged all the time. Same with a fwd antenna. USN photo courtesy of ussubvetsofwwii.org. 770k Crew and officers of the returning submarine being welcomed back by V.ADM Charles Lockwood, Commander, Submarine Forces, Pacific Fleet, congratulating subs skipper, CO Robert K.R. Worthington at left, on a successful cruise. Shaking hands with officer at extreme right is Capt. L.S. Parker, Squadron Commander, 29 June 1945. USN photo # 80-G-49761 from NARA, College Park, Maryland, courtesy of Sean Hert. 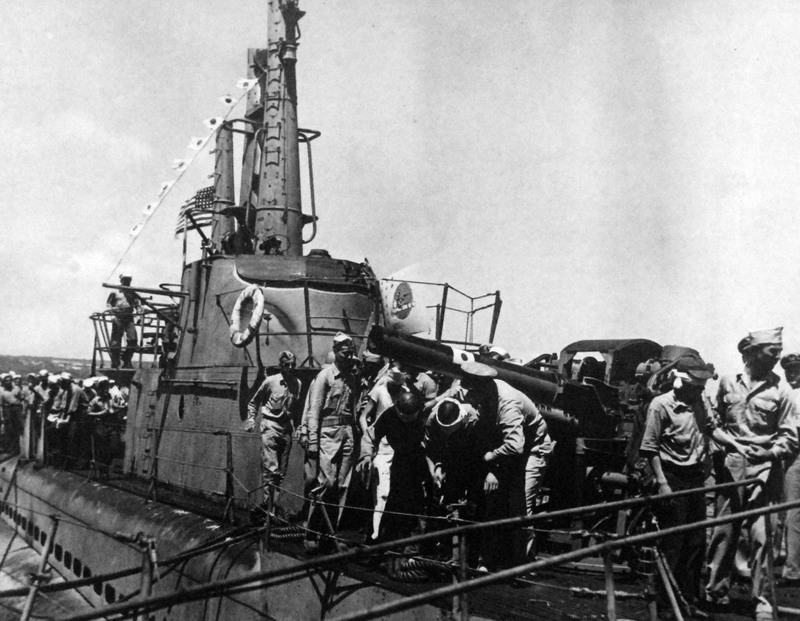 756k Jap prisoners aboard submarine returned to base, who were picked up at sea following sub's sinking of an enemy ship. Prisoners are turned over to Marines for transfer to a prison camp while crew enjoys showing off their prize. 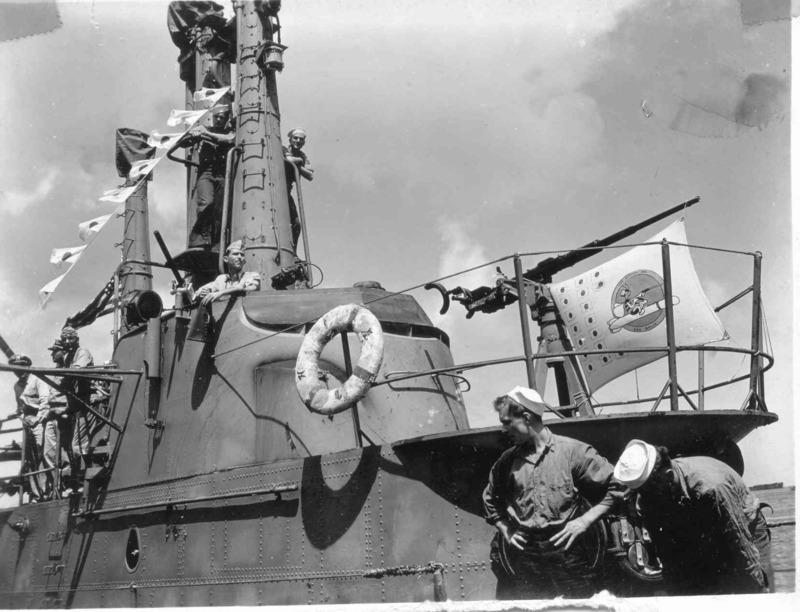 Note the Balao's (SS-285) emblem above her deck gun. USN photo # 80-G-49761 from NARA, College Park, Maryland, courtesy of Sean Hert. 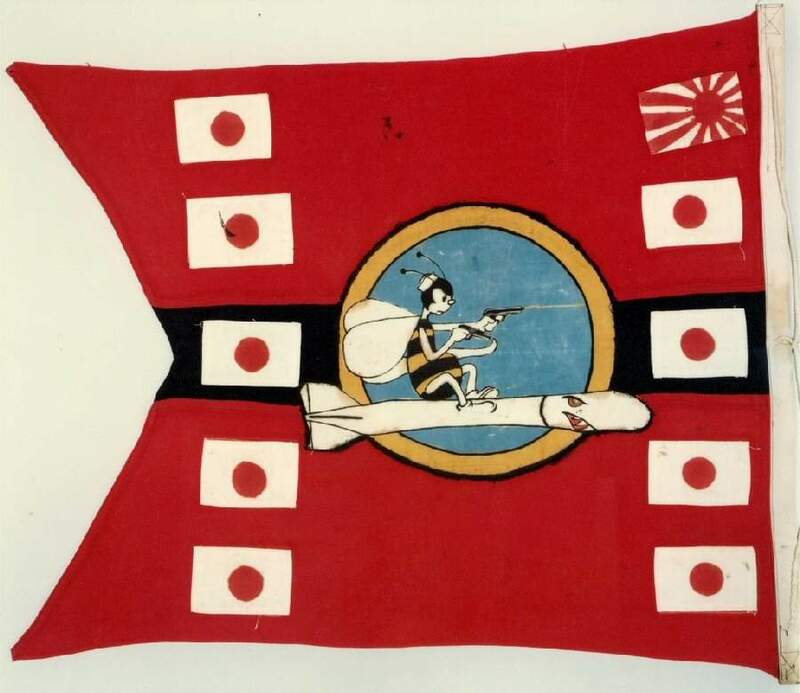 58k Balao's (SS-285) WW II Battleflag. USN photo courtesy of Naval Sea Systems Command & submitted by Bill Gonyo. 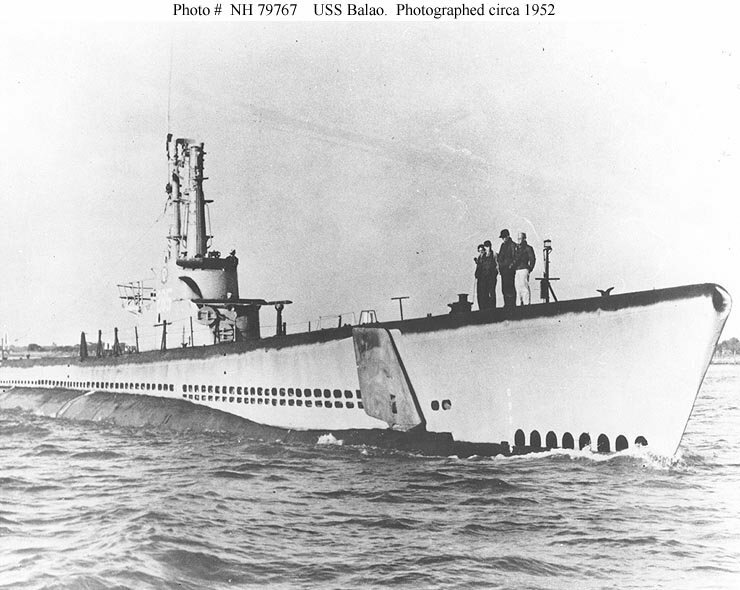 115k The Balao (SS-285), drawn by the renowned graphic illustrator John Barrett with the text written by naval author and historian Robert F. Sumrall. Their company Navy Yard Associates offers prints of most destroyers, destroyer escorts, submarines and aircraft carriers in various configurations during the ship's lifetime. The prints can be customized with ship's patches, your photograph, your bio, etc. If you decide to purchase artwork from them please indicate that you heard about their work from NavSource. Photo courtesy of Navy Yard Associates. 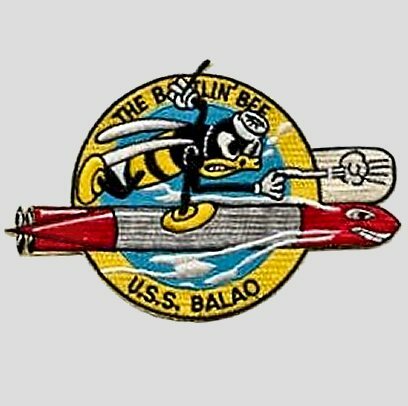 1.71k 17 page Balao (SS-285) PDF history. USN photo courtesy of Scott Koen & ussnewyork.com. 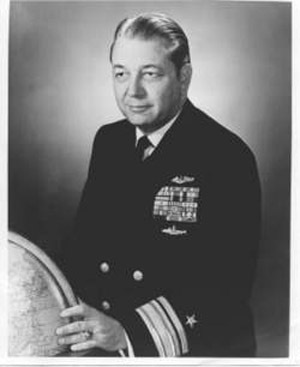 131k Vice Admiral William Wohlsen Behrens, Jr. was assigned to the Balao (SS-285) as Commanding Officer from 1953 to 1954. Photo courtesy of the Behrens family & submitted by Bill Gonyo. 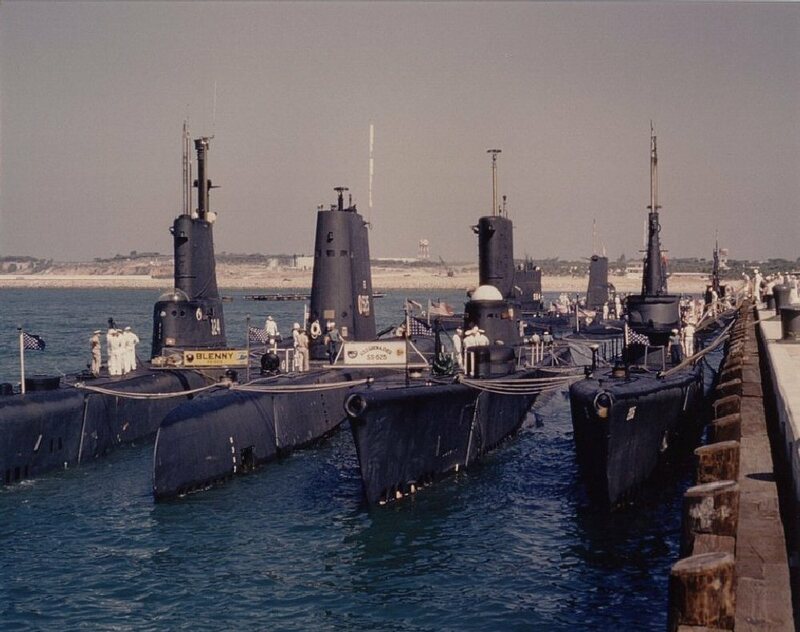 71k Balao (SS-285) & Sennet (SS-408) in Port Key West Fla, circa late 1950's. Photo courtesy of Jack Treutle (of blessed memory). 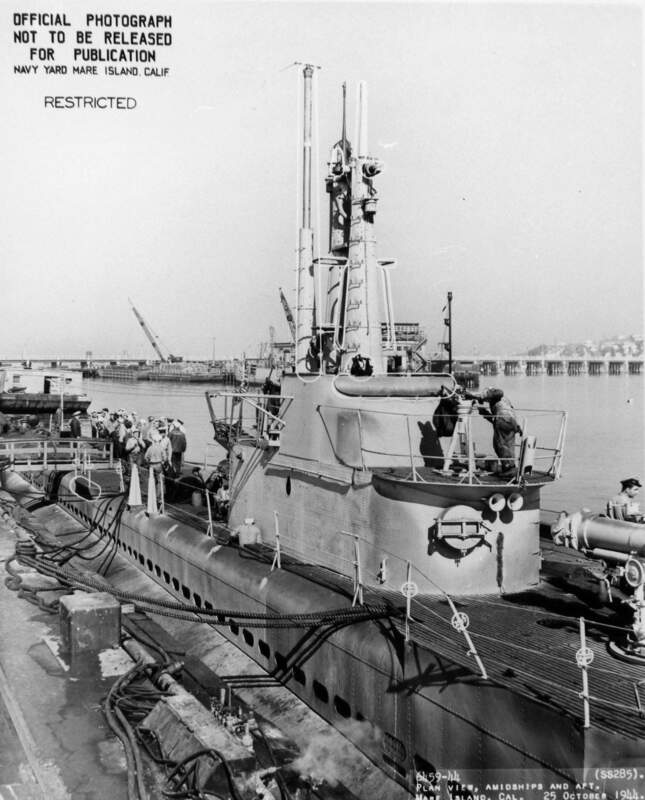 88k Balao (SS-285) photographed circa 1952. USN photo # NH 79767, from the collections of the US Naval Historical Center. Courtesy of Donald M. McPherson, 1974. 73k LCDR. 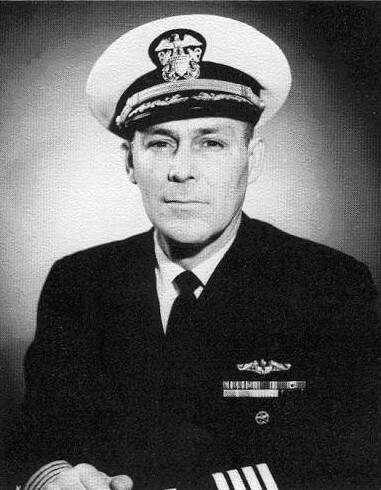 Maurice Oscar Muncie commanded the Balao (SS-285) from August 1958 to 1959. USN photo courtesy of Bill Gonyo. 278k Bow view of the Balao (SS-285) together with the Archerfish (SS-311) for the movie "Operation Petticoat" in 1959 while the boat was in Key West, Fla. Photos courtesy of Tommy Trampp. Photo i.d. courtesy of Robert Hurst. 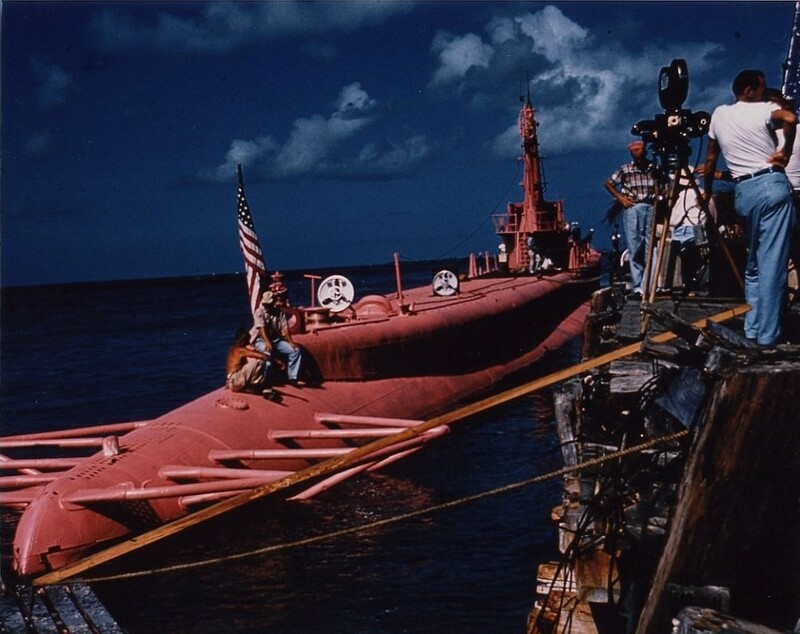 151k Balao (SS-285) painted pink for the movie "Operation Petticoat" in 1959 while the boat was in Key West, Fla. Photo courtesy of atule.com. 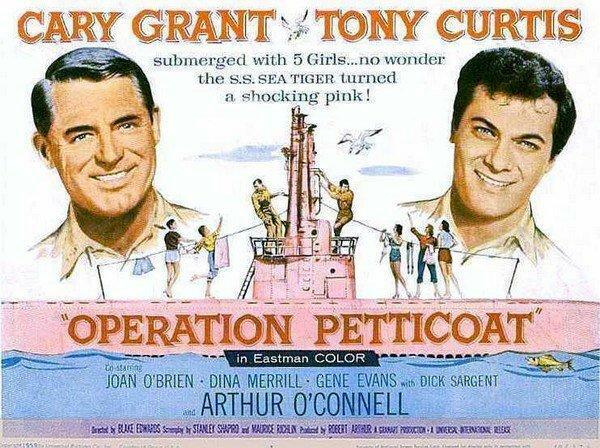 165k Cary Grant, Tony Curtis, and Dina Merrill, on the Balao (SS-285) during the movie "Operation Petticoat" in 1959 while the boat was in Key West, Fla. Photo courtesy of atule.com. 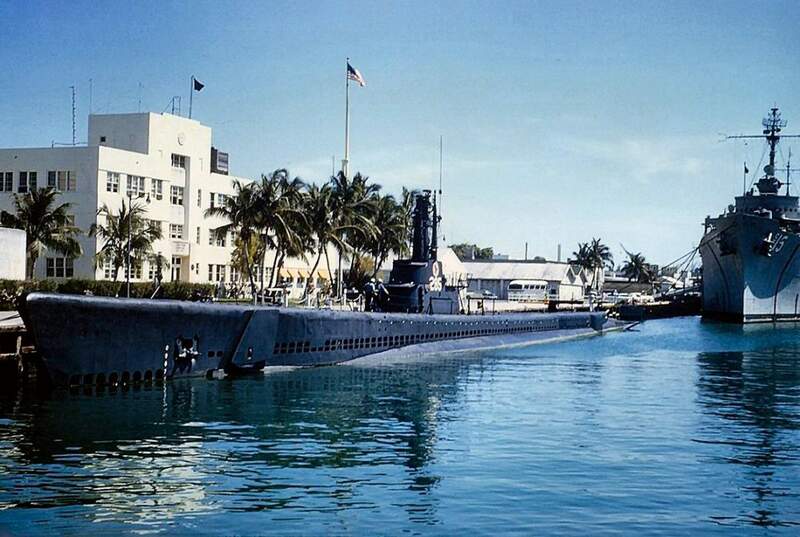 112k Balao (SS-285) going to sea from Key West. Photo by Tim "T-Spoon" Spoon & atule.com. 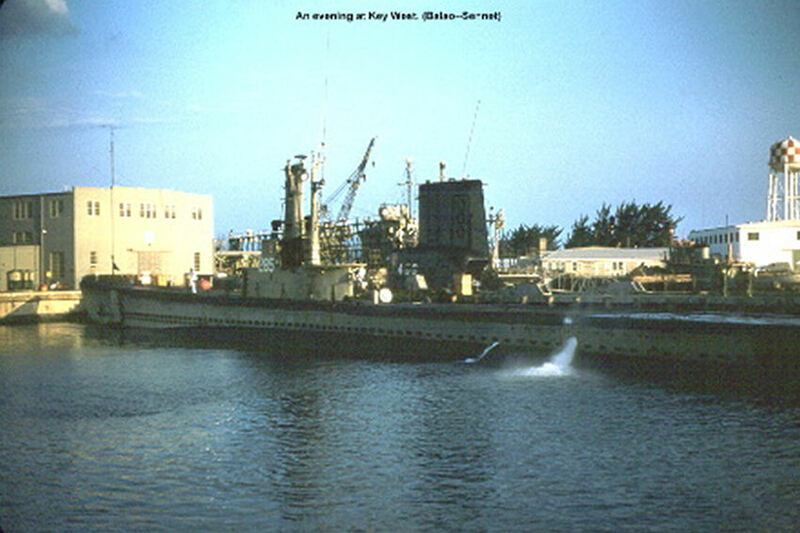 174k Balao (SS-285) and Bushnell (AS-15) in Key West, Fla,. Photo courtesy of John Hummel, (USN) retired. 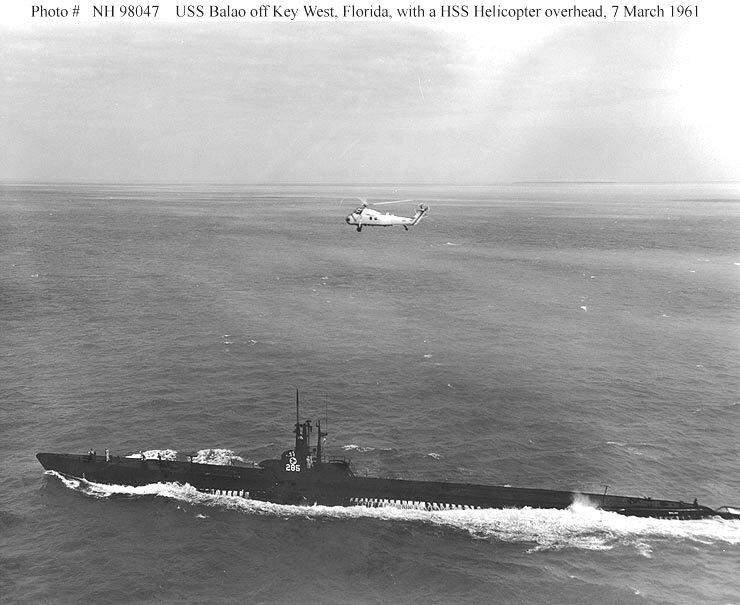 79k Balao (AGSS-285) exercising with a Brazilian S2F anti-submarine aircraft and H-34 (HSS-1) helicopter off Key West, FL., 7 March 1961. The Brazilian helicopter is flying over the submarine in this view. 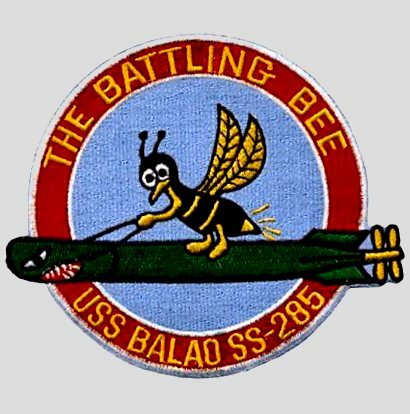 Balao is a unit of Submarine Squadron Twelve, whose insignia is visible on her fairwater, directly over her hull number. (see photo below) USN photo # NH 98047, from the collections of the US Naval Historical Center. 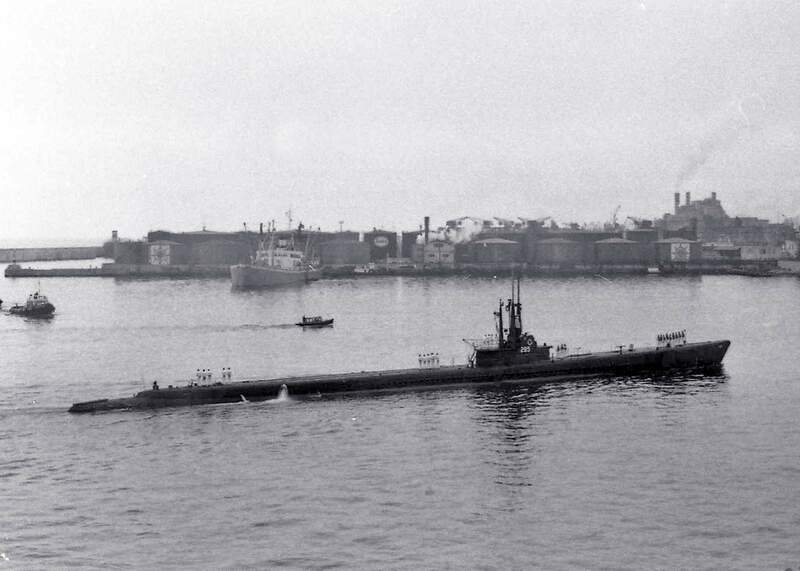 166k Balao (SS-285) arrived in Genoa on 24 May 1962. Photo courtesy of Carlo Martinelli. 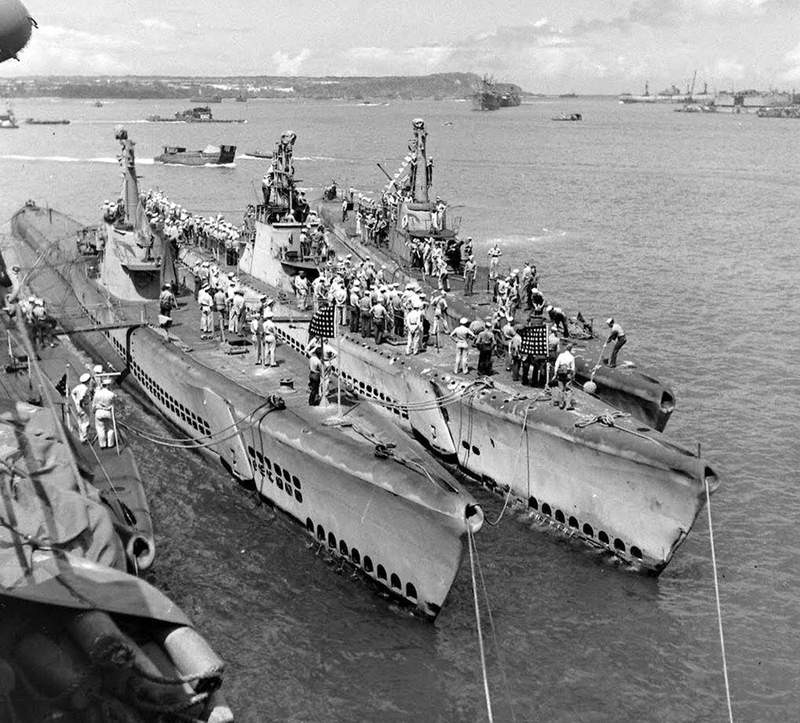 463k Nereus (AS-17) with three boats alongside: Balao (SS-285), Charr (SS-328) & Chivo (SS-341) probably around 1952, at San Diego. Photo courtesy of Tommy Trampp. 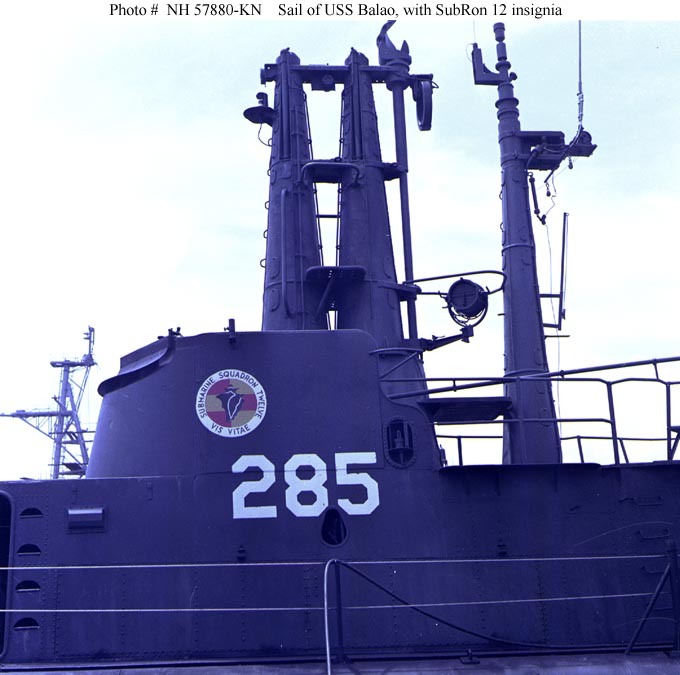 68k View of the Balao (SS-285) "sail", with Submarine Squadron Twelve insignia, circa 1963. 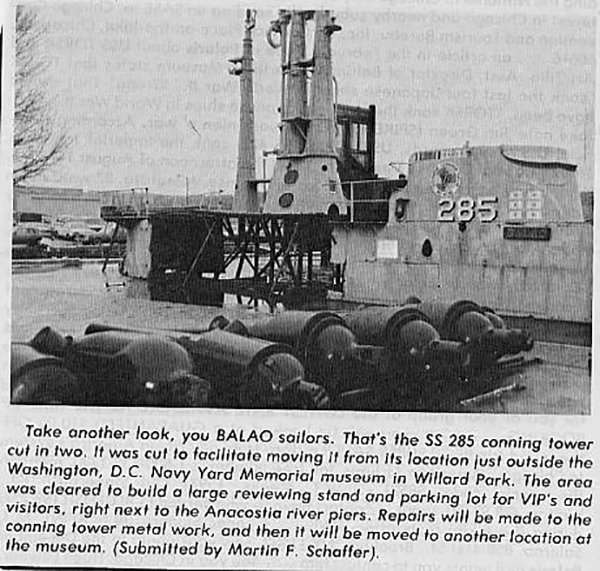 Removed shortly before Balao was expended as a target in 1963, this structure has been on exhibit at the Washington Navy Yard, D.C., since about the middle 1960s. USN photo # NH 57880-KN, from the collections of the Naval Historical Center. 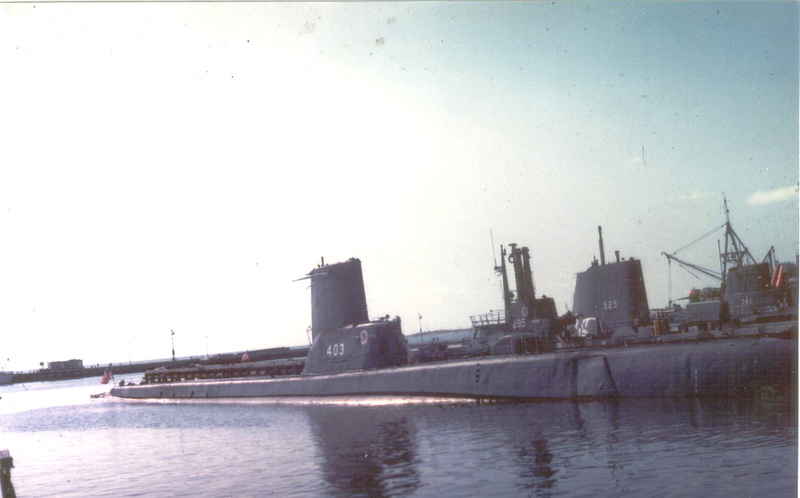 168k Sail away: As many different types of sails as there are boats in this photo of Squadron 12, Key West Fla, in Mid 60's: Atule (SS-403), Balao (SS-285), Grenadier (SS-525) & Bluegill (SS-242). Photo courtesy of John Hummel, (USN) retired. Text I.d. courtesy of John Hummel, Mike Keating & Dave Johnston. 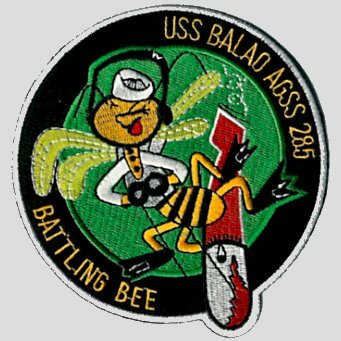 262k Take another look you Balao (SS-285) sailors. That is the (SS-285) conning tower cut in two. 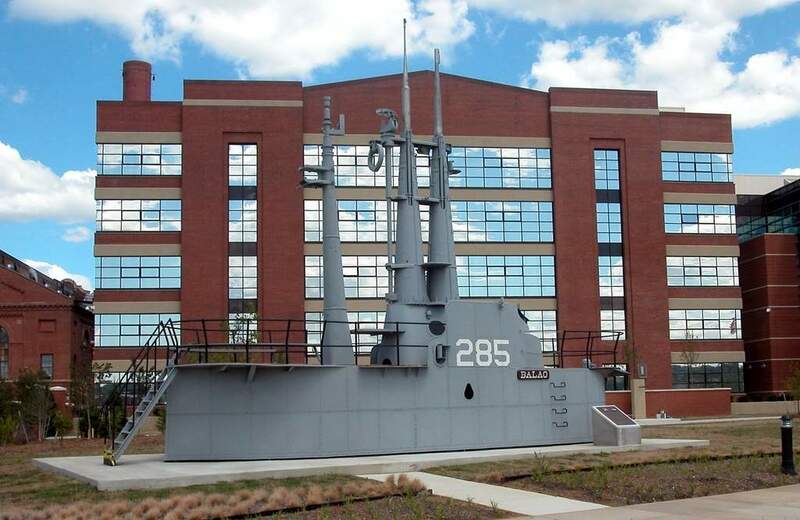 It was done to facilitate its moving from its location just outside Washington D.C. Navy Yard Memorial museum in Willard Park. The area was cleared to build a large reviewing stand and parking lot for VIP's and visitors.... USN photo courtesy of Scott Koen & ussnewyork.com. 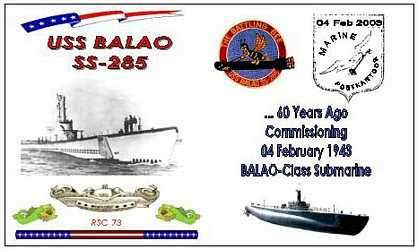 19k Commemorative post mark on the occasion of the 60th year of the Balao's (SS-285) commissioning, 4 February 1943 - 4 February 2003. Courtesy of Jack Treutle (of blessed memory). 93k The sail of the World-War-II era Balao (SS-285), on display at the Washington Navy Yard. USN photo courtesy of Naval Sea Systems Command & submitted by Bill Gonyo. 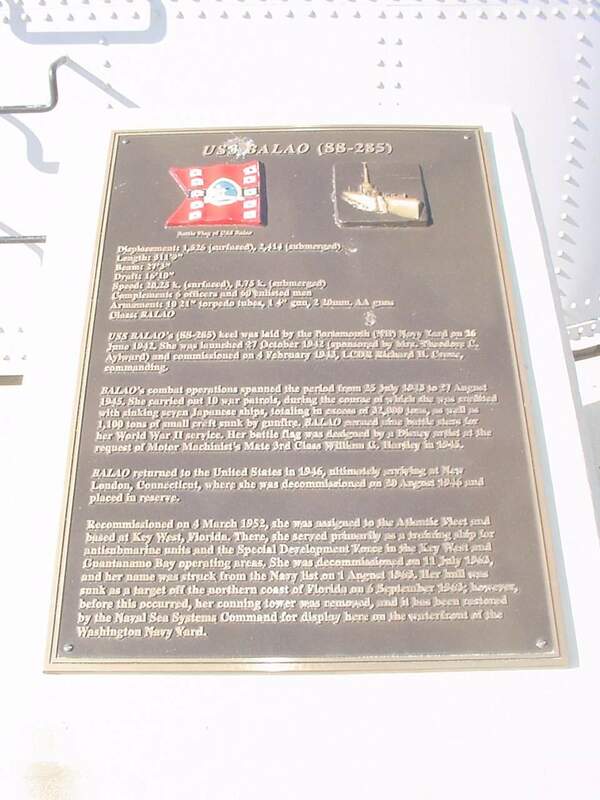 110k Photo of a plaque of the Balao (SS-285) that is next to the sail on display at the Washington Navy Yard, February 2005. Photo courtesy of Wendell McLaughlin.